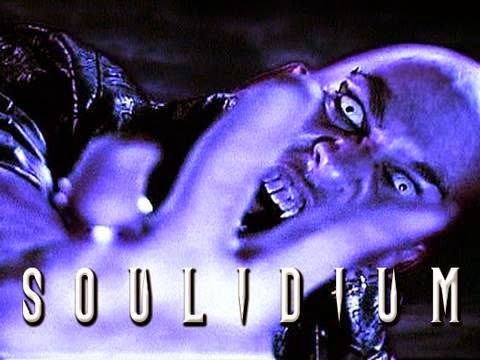 Vampire Beauties: Vampiress Music Video: Soulidium "Live Forever (Vampire Rock Anthem)"
Vampiress Music Video: Soulidium "Live Forever (Vampire Rock Anthem)"
Soulidium out of Tampa, Florida if you can't tell is a hard rock/metal band. Sadly watching as many low budget vampire movies as I have I am almost oblivious to this style of music though this one is pretty catchy. None the less this isn't a music review blog so lets skip to the important part. This is a very well put together music video definitely worth watching. The story (yes it has a story) is that the members of the band are vampires. The Bands frontman Micheal McKnight grabs an attractive young girl in an ally and bites her turning her into a vampire (above). This leads to the girl going on an extended night of attacking various other people including another attractive girl who she also turns into a vampire (below). So basically outside of the first 30 seconds of the video the entire thing is attractive women fanging out and biting people. In other words exactly how I wish every vampire film ever made would be.